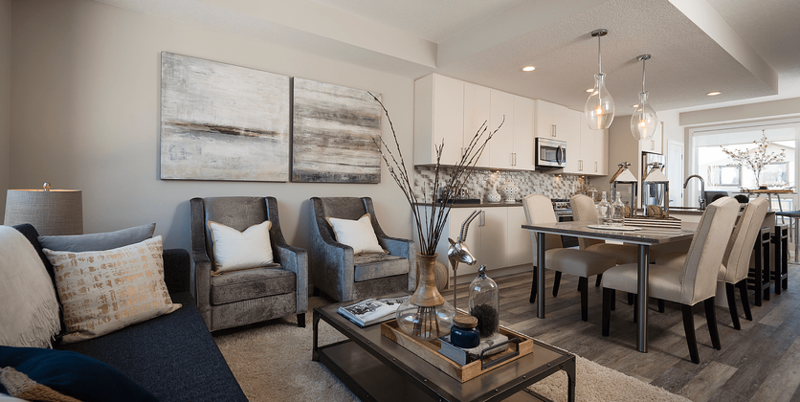 If you’re looking for style and sophistication combined with a little classic elegance, then this three bedroom, two and a half bathroom D2 model townhome at Vivace at West 85th may be the perfect fit for you. Versatile, timeless, and boasting massive appeal, this townhome possesses nearly 1,500 square feet of thoughtfully designed finishes and features. Best of all, this desirable new model is move-in ready. The design is extremely sophisticated and the colour palette represent an elegant, timeless look which gives you the perfect base to pull in your own personal touches. In addition to its sleek design, a major appeal of this townhome is the sheer amount of outdoor living space. You’ll notice this from the moment you arrive, as the front door is conveniently situated on one of the three outdoor terraces included with this model. Inside, luxury vinyl plank flooring creates seamless sightlines throughout the main level. Completely open and abundant in space, the front entry gives way to the open living room, dining area, and kitchen. The spacious living room offers ample natural light, which serves to highlight the stunning charcoal quartz countertops of the eat-in kitchen island and attached dining table. You’ll also notice the home's sleek ivory cabinetry, luxurious glass backsplash, and glimmering stainless steel appliances (which includes a slide-in gas range). Venturing a little further into the kitchen, you’ll find additional closet space and a roomy pantry, as well as a chic powder room. Here too, is the rear entry leading to this townhome’s signature rear terrace. Perfect for relaxing and entertaining guests, the smooth transition from the kitchen to this outdoor space speaks further to the townhome’s impeccable design. Venturing upstairs, you’ll come across the conveniently located in-suite laundry area with high-efficiency washer and dryer, secondary bedrooms, and three-piece main bathroom. Both bedrooms offer plenty of room (one even includes a walk-in closet), natural light, and lush carpeting. With the bathroom situated between the two bedrooms, the upper floor maintains functionality and easy accessibility. A truly unique quality in townhome living, the D2’s sizeable loft provides the ultimate retreat. 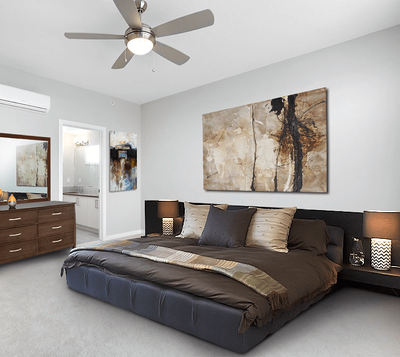 At well over 180 square feet, the master bedroom area provides a generous amount of room. This theme is continued by the loft’s adjoining walk-in closet where you’ll find more than enough space for clothing, accessories, and storage. This townhome’s stylish and sophisticated design is also emphasized by the loft’s spa-inspired four-piece ensuite. Here, the sophisticated charcoal quartz countertops, designer plank tile, and chic crushed glass accents only serve to highlight the ensuite’s dual vanities and frameless walk-in glass shower. Lastly, and perhaps most importantly at the end of a long day, you can escape to your very own private terrace – yet another distinct feature of the D2 master loft. This immediately-available home also comes with the added benefit of two parking stalls, one of which is underground. The convenience factor extends to the surrounding community of West 85th, which offers ample amenities including nearby shopping, services, restaurants, transit (with easy access to downtown), green spaces, and much more. The D2 townhome at Vivace at West 85th is the perfect blend of style, sophistication, and flair. 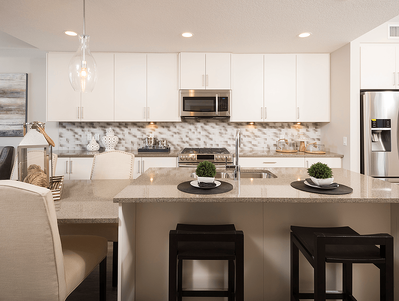 Its unique floor plan combined with high-end features make the D2’s upscale design the perfect fit for anyone looking for a different pace of life in this trendy community. 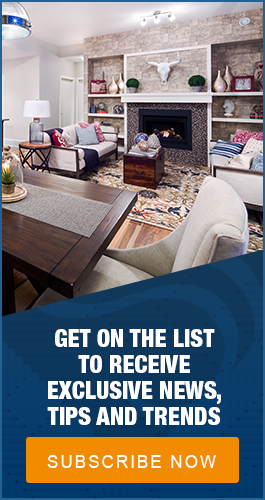 Stop by today to learn more about how you can make this elegant home your very own.